Looking for the perfect Valentine Day card to give this year? 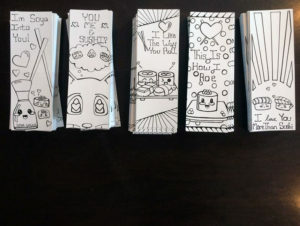 I have a variety of cards for you to choose from! Rather it is for a friend, family member, that special someone or just to wish someone a happy day, these cards will suit that message. Beside each design, you will see where you may find and purchase these cards. 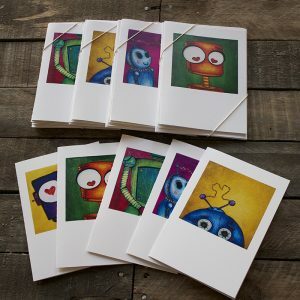 Package of 5 greeting cards, each card featuring a different design. Cards are blank inside and comes with 5 envelopes. Available at: Launch Gallery and Under One Sun in downtown, Peterborough. 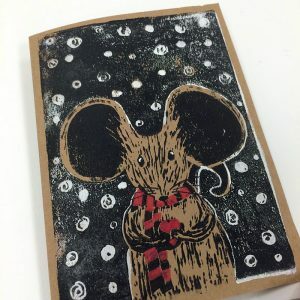 Package of 5 greeting cards, featuring a unique, hand carved linocut design of a mouse holding on to a valentine. Each card is handprinted using a two step lino stamp process. Cards are also available at the Studio for pick up, appointment is recommended. 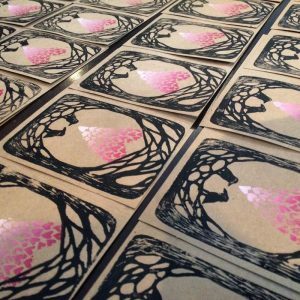 Package of 5 greeting cards, featuring a unique, hand carved linocut design of two crows amongst the trees with an ombre heart above. 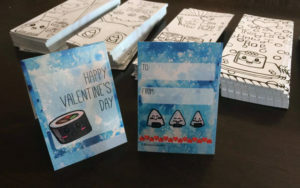 Each set comes with 25 cards, featuring 5 different sushi designs. Stickers included as well! Cards are available at the Studio for pick up, appointment is recommended.